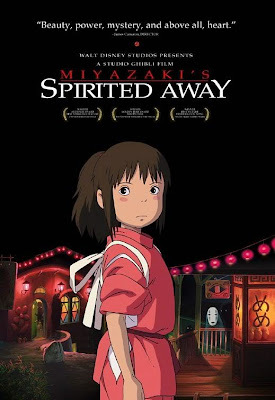 About four years ago, I sat down with some friends in my apartment in San Antonio and watched a Japanese animated film called "Spirited Away". 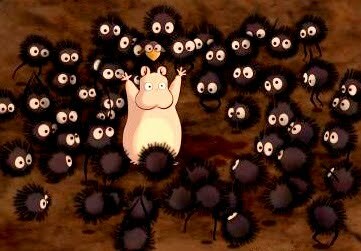 At the time, I had never heard of either the movie (I probably should have, it won best animated picture at the 2003 Academy Awards) or the director, Hayao Miyazaki, but my friend insisted that we watch it. I am very glad we did, as the movie was fantastic. I quickly had Michelle watch it, and she loved it as well. A couple weeks later we had gone through almost all of Miyazaki's other works, and both counted him as one of our favorite directors and animators. The story of "Spirited Away" centers around Chihiro, a 10-year old girl whose family is moving to a new neighborhood, away from all of her friends. On the trip to her new house, her family takes a detour, and after getting lost, they find themselves in a new land, filled with spirits and monsters. 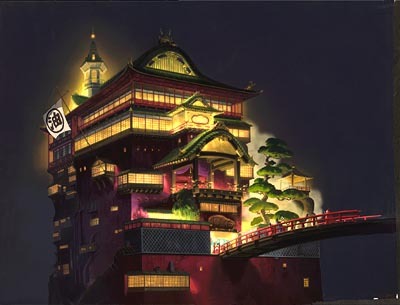 Chihiro's parents are soon turned to pigs, and the majority of the story revolves around Chihiro working at the old witch Yubaba's bathhouse trying to find a way to help her parents. 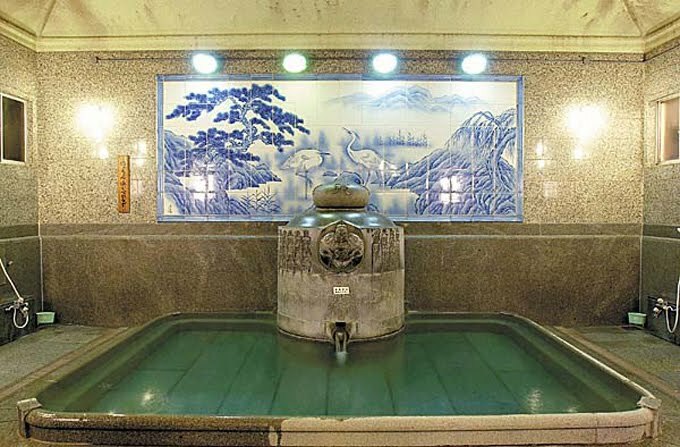 It turns out that this bathhouse isn't a total figment of the imagination, but was based upon an actual bathhouse here in Japan called Dogo Onsen (Dogo Bathhouse). Not only that, the bathhouse is located right across the inland sea from us on the island of Shikoku, near the city of Matsuyama. Usually our island is incredibly inconvenient for getting almost anywhere, but a ferry service takes you directly from our island to Matsuyama in under an hour, so for once being where we live in the middle of nowhere comes in handy. A couple weeks ago we decided to take advantage of our location to go and to experience the authentic "Spirited Away" bathhouse. We took a ferry to Matsuyama, and after exploring the castle and city park, took the tram to Dogo Onsen. We knew we were getting close as the crowd begin to grow and "Spirited Away" themed stores started popping up. Dogo Onsen itself was impressive. The water springs that dot the area have been used for almost 3,000 years, and the current bathhouse structure itself was built over 100 years ago (with the preceding structures that burned down hundreds of years older). We strolled around the outside of the building taking photos and people watching (standard wear around the bathhouse is the yukata - light cotton festival wear) and taking in the atmosphere. We had planned to go in and use the bath, but now that we were standing in front of the building with a hundred Japanese tourists all around us and no fellow foreigners in sight, we got nervous. After dithering outside for 30 minutes working up our courage, we went up to the ticket gate, bought our ticket and went inside. We were led to our private tatami room on the third floor, where we changed into our yukatas. The staff then led us to the Tama-no-yu, or "bath of the spirits", where we separated to enter our respective (male and female) bath areas. Protocol for using a Japanese bath is usually anxiety inducing for foreigners. In general, it follows something like this: enter the bath dressing room in your yukata --> shed all the clothes, put the yukata in the locker and pick up a small towel --> enter the room where the bath is --> use the shower stall next to bath to wash your hair, underarms and privates --> enter the actual bath for two or three minutes, making sure the small towel does NOT touch the water (usually this is accomplished by putting the towel on top of your head) --> after the two or so minutes, get out of bath again and use the shower to do a full body wash --> rinse all the soap off your body --> reenter the bath --> stay in bath for up to five minutes --> get up and rinse off using the shower --> re-enter the bath (and repeat for as long as you like). What makes it so intimidating is that there are usually a lot of Japanese people who have their eyes peeled on the "foreigner", so everyone is keenly aware of any mess up. Once I was in the bath I was shocked at how the water felt. There are many ancient Japanese folktales that tell how the old gods used to use the baths to heal their wounds, and I could see how these stories developed. The water - incredibly hot and filled with minerals and sulphur - was completely different than any other suana or bath I had been in. I doubt my body will ever feel that relaxed again. 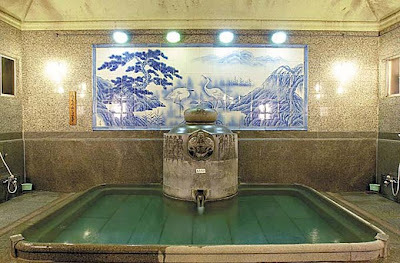 The other Japanese in the bath were very nice as well, and we enjoyed conversation as far as my Japanese would allow. Probably as a result of my mild dehydration from walking around Matsuyama all day, I started feeling dizzy after about 20 minutes in the bath area and had to leave. I then met up with Michelle in the waiting area and we were taken back to our rooms, where we enjoyed Oolong tea and mochi rice balls.